U.S. stocks slipped lower Friday, causing the S&P 500 to end the week with its first back-to-back decline in almost a month and snapped a three-week stretch of gains. Investor sentiment edged lower after consumer prices rebounded last month, but rose less than forecast, while retail sales strengthened in April. Despite the news, Wall Street remained concerned about numerous department store retailers who released disappointing quarterly earnings during the week. Meanwhile, technology sector gains drove the NASDAQ Composite to a fourth weekly gain. In overseas markets, the MSCI Emerging Markets index advanced nearly 2.5% last week, posting five consecutive gains to close above 1,000 for the first time in two years. For the week, the S&P 500 fell -0.26% to finish the week around 9-points below its all-time high of 2,399.63 reached on Wednesday. The Dow Industrials fell -0.53%, capping four days of declines, and the MSCI EAFE (developed international) advanced +0.32%. The Consumer Price Index (CPI) rose in late 2016, as energy cost pass-through picked up, contributing significantly to above 3% CPI inflation in the three months through January 2017. J.P. Morgan’s inflation outlook had initially forecast a moderation in energy inflation, based on a stable $54/barrel Brent Crude price for the rest of this year. But in reality, prices have fallen roughly 10% over the past two months, and this decline helps explain the recent slide in inflation to an expected 1.2% in the three months through April. 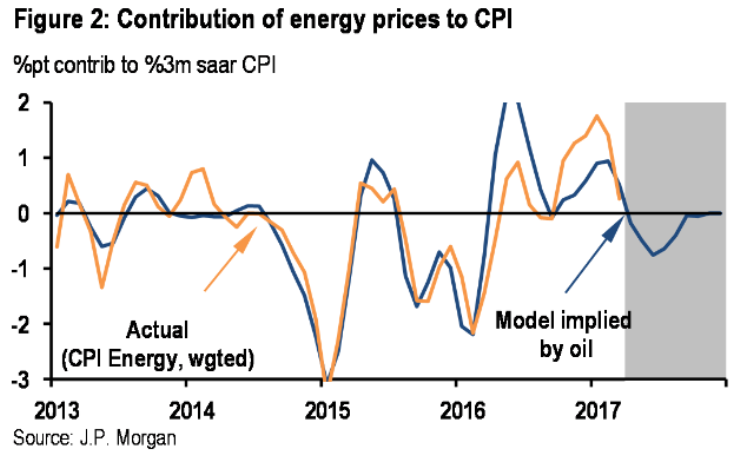 As Chart 1 illustrates, energy prices will once again have an important influence on 2017 inflation. If Brent Crude oil again falls back to its recent low of $48/barrel, J.P. Morgan’s CPI model points to an inflation rate close to 2%. By contrast, a rebound to $60/barrel would move the CPI inflation rate up to 2.5%.